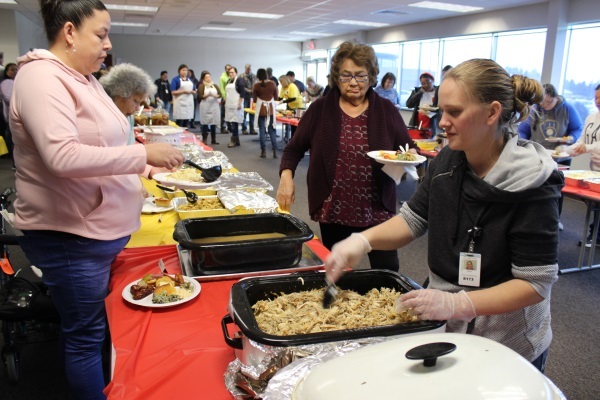 In observance of Thanksgiving Day, employees of the Ho-Chunk Nation were honored with a Thanksgiving meal on Wednesday, Nov. 21, in the Tribal Office Building, Black River Falls. Each department was responsible for bringing an assigned dish to pass, with the Office of the President providing turkey, gravy, stuffing, and mashed potatoes. Before the meal was served, Ho-Chunk Nation President Wilfrid Cleveland gave a greetings and inspirational speech about Thanksgiving and being grateful. Many Ho-Chunk Nation employees were the servers of the food.